Shoe repair shop on Selsdon Road in South Croydon. 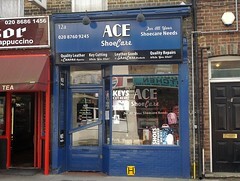 As of August 2012, the frontage advertises "quality leather and canvas repairs, key cutting while you wait, leather goods and shoe care products". Last edited 2019-03-29 13:07:55 (version 19; diff). List all versions. Page last edited 2019-03-29 13:07:55 (version 19).